Boasting a proud heritage that can be traced back to 1849, Crabtree of Gateshead remains one of the world's foremost manufacturers of high-quality metal decorating presses and coating machines. Sold in more than 90 countries worldwide, the company’s advanced lithographic printing presses and associated equipment have ensured Crabtree’s ascendancy within this very competitive sector. Crabtree of Gatehead’s prolific Research and Development Department has ensured a continuous succession of industry ‘firsts’ that have resulted in on-going outstanding levels of global sales. In recognition of the company’s success, over the years it has received many accolades, including the award of the prestigious Queens Award for Export. Much of Crabtree of Gateshead’s excellent reputation is based on the renowned reliability and high-quality of the company’s products. To help maintain its high standing within the global metal decorating marketplace, Crabtree invest heavily not only in advanced manufacturing plant, but also in the best available Quality Control and Inspection equipment. In addition to the vigilance of its skilled Inspectors, the quality of Crabtree products is ensured by each of the company’s machine operators being responsible for the quality of their own output. 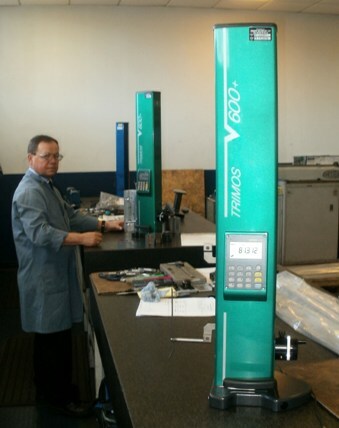 Both inspection and production staff have access to comparable inspection equipment such as the two, recently purchased advanced Trimos V600+ height gauges from Bowers Metrology. Company Chief Inspector, Albert Rossiter explained: “Having enjoyed excellent service from our previously used three Trimos Vertical 3 height gauges, that have been used in our Inspection Department and on our Shop Floor for the past 24 years, we thought that it was high time we replaced a couple of them with more up to date technology. “As our Trimos Vertical 3 height gauges had provided excellent levels of accuracy and repeatability on 2 and 3 shift systems, and sometimes throughout around the clock working patterns, we recently searched for similarly robust yet accurate gauges. As Trimos had recently launched the V+ series of height gauges, we requested a demonstration from the company’s UK Agent, Bowers Metrology. “We purchased the V600+ version of the series range, as its 600mm capacity is able to accommodate the vast majority of our parts. The V+ Series’ electronic display provides many features not normally found in gauges of this type, such as the ability to automatically calculate both internal and external diameters and centre-lines, offsets, slot widths and grooves, whilst useful Min and Max functions are also included. Available in the UK from Bowers Metrology, V+ Series models cover measuring capacities from 300mm – 1000m, all V+ Internal and external diameter measurement are accomplished with the help of a unique floating carriage system and a built-in air pump that helps reduce operator fatigue. The advanced Trimos gauges operate via rechargeable batteries that can run for 120 hours on a single charge. For more information on the range of Height Gauges available from Bowers click here.